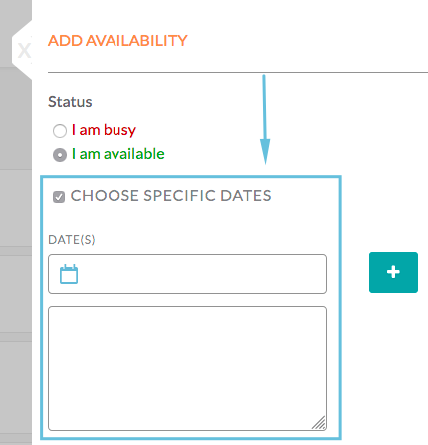 The Availability tool lets people set either general or specific availability. 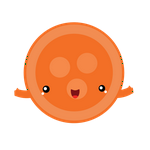 General Availability is used when you have recurring times or days that you are always available or always busy. 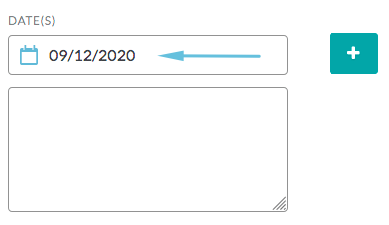 Specific Availability is used for adding one or more individual dates that you can or can't work. Availability is different than time off requests (see availability vs time off). Note: The Availability tool allows you to indicate a busy time or an available time, depending on how the Shiftboard site is configured. If Shiftboard is configured to assume everyone is available, then you submit times that you are not available. 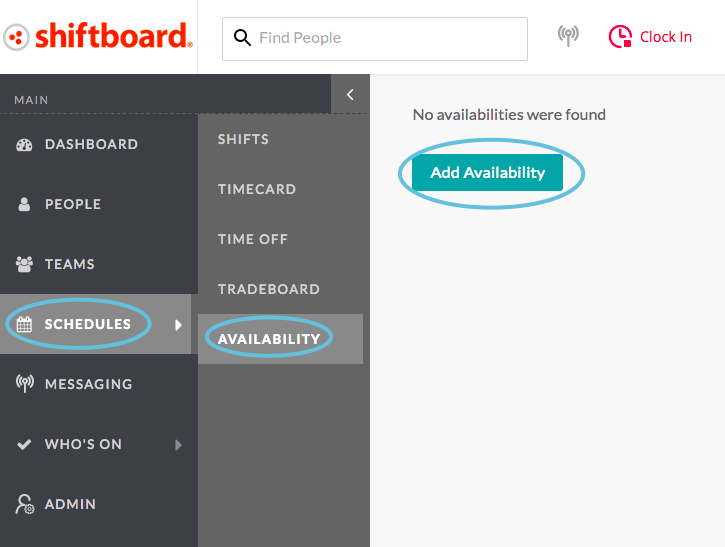 If Shiftboard is configured to assume everyone is unavailable, then you submit times that you are available. Shiftboard automatically suggests the correct choice based on your site’s configuration. 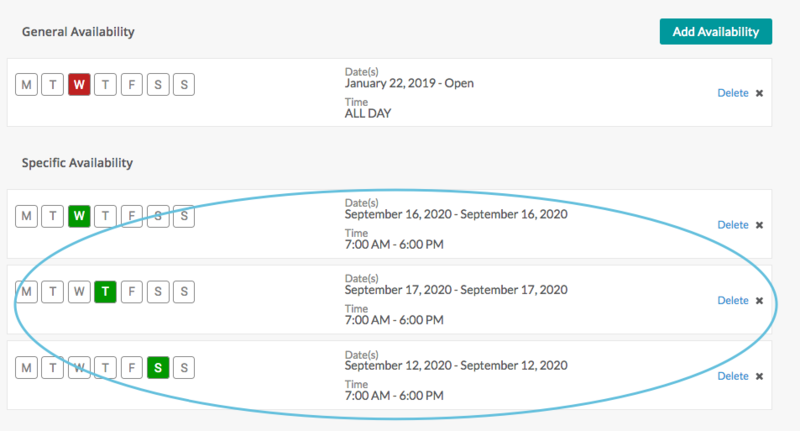 In the example above, the person normally doesn’t work on Mondays and Wednesday (general availability), but they are available to work on one specific Wednesday (specific availability). 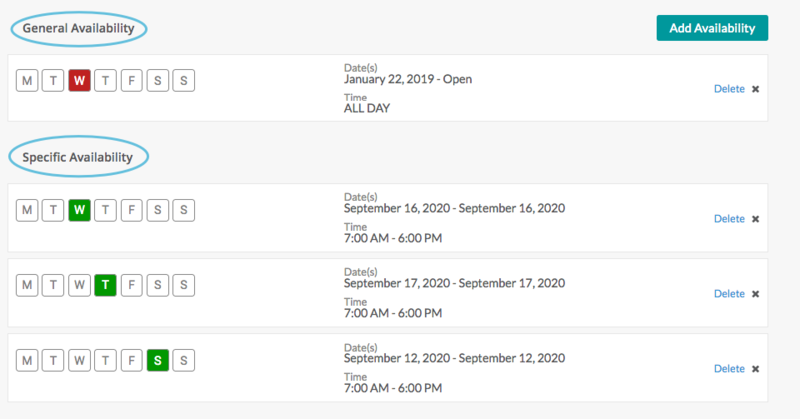 The Add Availability page then opens and allows you to set status, start and end dates, days of the week, time, and team. All availabilities are added as general availability, unless Choose Specific Dates is selected. 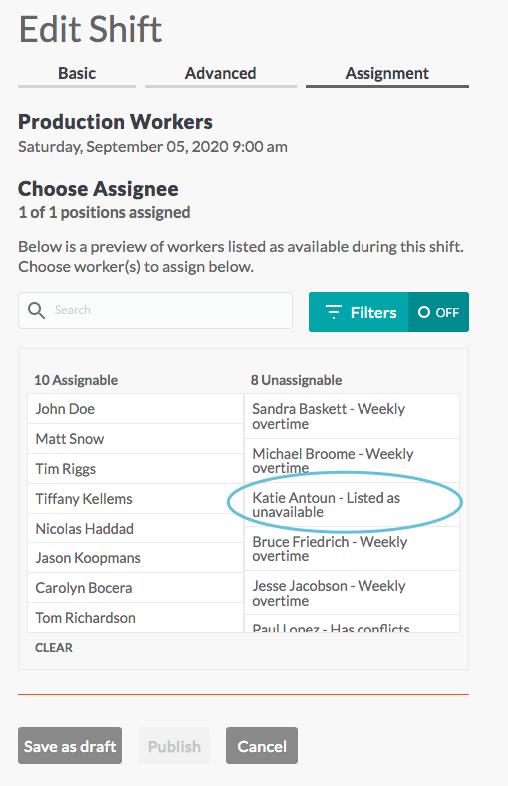 Status—Select “I am busy” or “I am available.” Shiftboard will automatically select the choice that aligns with the information you need to add based on the site setting. For example, if the site is configured to assume everyone is available, then “I am busy” will be automatically checked. 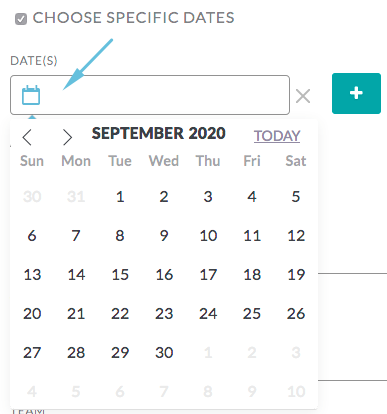 Choose specific dates—Allows you to choose specific dates that you are busy/available (see How to add specific availability section below). 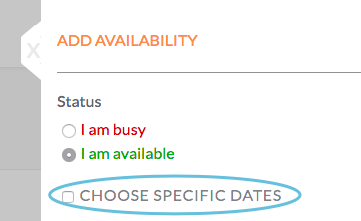 Start date—Select when you want your availability to start. 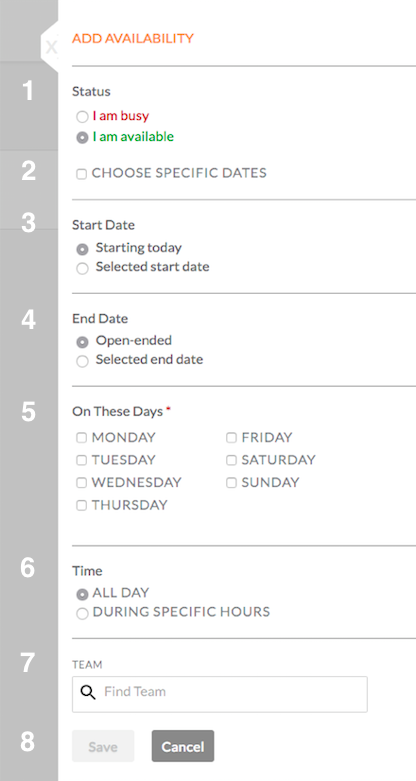 Choose from “Starting today” or “Selected start date,” which lets you pick a different date from a mini calendar. 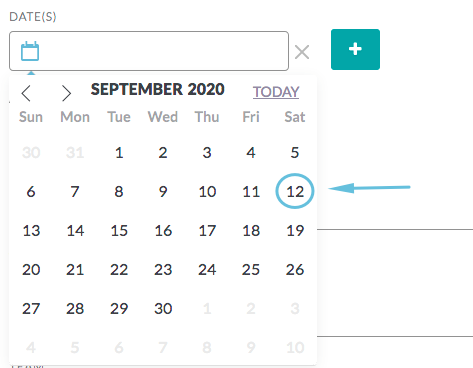 End date—Allows your availability to be left open-ended or to end on a specific date selected from a mini calendar. Availability marked as open-ended will remain in the availabilities list until removed by the user (or a manager). 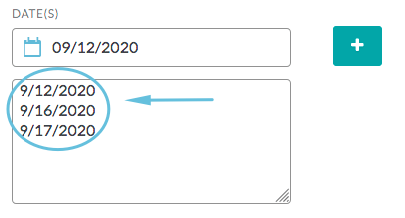 Availability marked with a specific end date will be automatically removed from the availabilities list after that date has passed. On these days—Select the day or days of the week that you are available or busy. Time—Allows you to indicate that you are free/busy either All Day or during Specific Hours. 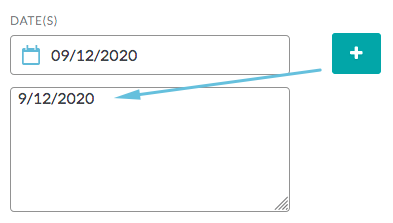 Team—If you are assigned to multiple teams (workgroups), use this field to limit this availability to a specific team. Click in the box to select a workgroup from the drop-down list. If no team is selected, then this availability applies across all of your teams.Note: if your workgroup name is not Team, you will see your workgroup name. Save—Saves and adds this availability to the availabilities list. Cancel—Information entered into this form is removed and not saved. Note: All dates must have the same Time availability (e.g. All Day or the same specific hours).